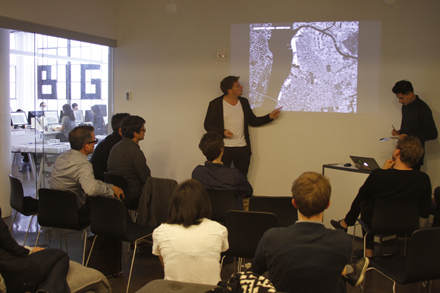 Bjarke Ingels (left) reviews one of the student projects in a midsemester review at the BIG office. Photo courtesy of BIG. When Hurricane Sandy hit the New York metropolitan area, just over a year ago, it brought the realities of global warming unsettlingly close to home. Since then, a number of New School students and faculty members have been involved in rebuilding communities affected by the storm. This fall, students in the Master of Architecture program at Parsons have been at the table for one of the more eagerly anticipated design competitions surrounding this effort, Rebuild by Design. They are part of a team led by the Bjarke Ingels Group, often referred to as BIG. Over the past decade, BIG has become one of the world’s leading architecture firms. BIG’s work includes two groundbreaking residential developments in Copenhagen, VM Houses (2005) and Mountain dwellings (2007); a master plan for one of the world’s largest eco-developments, Zira Island in Azerbaijan (2008); and West 57th Street in New York, a residential, cultural, and commercial development currently rising along the West Side Highway. What ties BIG’s work together is an approach to urban development combining two philosophies: “social infrastructure,” an interweaving of public infrastructure with social planning, and “hedonistic sustainability,” development that is both environmentally sustainable and economically profitable. Bjarke Ingels brings this approach to the Rebuild by Design competition and to the studio course he is currently co-teaching at Parsons with Daniel Kidd, a BIG designer and project leader. In this studio course, called Cities with Wet Feet, students work individually and in teams on proposals for rebuilding select sites around the metropolitan area affected by Hurricane Sandy; the proposals are also scalable solutions addressing the vulnerabilities of the entire region. Working with the BIG team involved in the design competition, students have engaged in a back-and-forth with Ingels and Kidd that brings into focus the realities of building in New York. In addition to participating in the studio sessions led by Ingels and Kidd, the students have been involved in many of the activities coordinated by the Rebuilding by Design organizers during the first phase of research, which has enabled them to experience the public process firsthand. Among the student projects are the creation of berms at the mouth of the Newtown Creek and along the FDR Drive that would serve as a cultural waterfront area as well as a defense against flooding; a sculptural promenade that weaves in and around lower Manhattan; and a reconfiguration of the Rockaways into a series of fortified islands. Acosta’s project, The Dry Line, is an elevated urban park along the Hudson River that would serve as a flood barrier but encompass a number of activities. “The implementation of multiple uses for parks and public spaces in the city is a theme I will continue to explore in my thesis next semester,” she said. Ultimately, Cities with Wet Feet is an extension of the work that has set the Master of Architecture program apart from those at other schools—the engagement of its students with the real world. Other examples are the program’s signature Design Workshop, in which students undertake design-build projects with nonprofit partners, and Empowerhouse, The New School’s recent collaboration with Habitat for Humanity to build sustainable and affordable housing in low-income urban neighborhoods.